Have you seen the Mugshot of the Drug dealer Bailey? 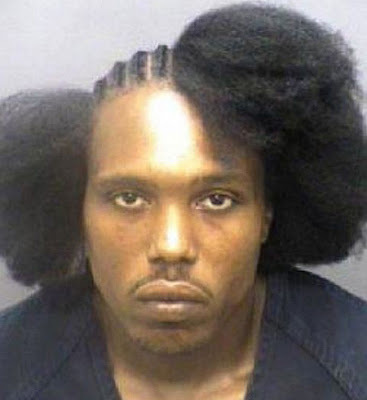 Drug dealer Mugshot shows unconventional hairstyle. He was arrested with his hair half-braided - and half in a huge bushy afro - Marcus T. I think for worst hairstyle competition of all time Bailey could easily win award. What you say?? It is sad news for the fans of the Actress Farrah Fawcett as she is in a critical condition in an intensive care unit with all her family members and friends together to meet her at last time. Since 2006, she has battled against cancer for three years. The beautiful Kim Kardashian’s sister Khole Kardashian will celebrated her 25th birthday with her two sister and other friends at Pure Nightclub in Caesars Palace, Las Vegas. Its looks like that they will have really good time. She was also celebrated her 24th birthday in Pure Nightclub. Here you will get latest information and news from around the net.